The long-term goal of research in this lab is to investigate macroevolutionary patterns in large-bodied terrestrial vertebrates, using dinosaurs as a model, and evaluate their relationships to climatic and environmental change. 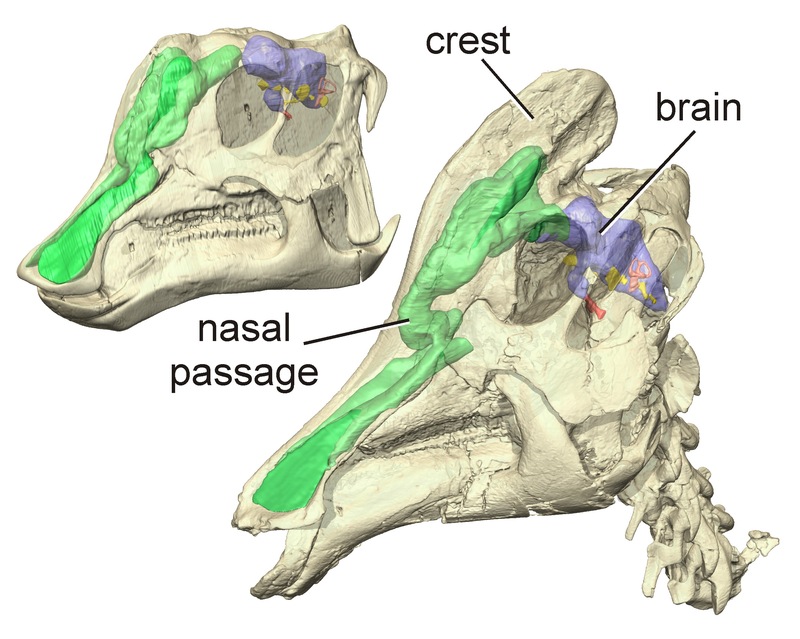 This research aims to integrate comparative anatomy, ontogeny and osteohistology, body size, and phylogenetic systematics of dinosaurs with emerging paleoclimatic and paleoenvironmental data to evaluate the role of climate and environmental change on patterns and processes of terrestrial vertebrate evolution, life histories, historical biogeography, and diversity leading up to the end-Cretaceous extinction event. This page will detail some of my research projects. For a list of supplementary data files, please see this page. For information of the International Hadrosaur Symposium, please see this page. The lab is equipped with a brand new rare-sample thin sectioning and histology lab, a visualization lab that includes powerful 3D visualization software for working with CT data, and a x-y-z automated stage microscopy and photography lab. This state-of-the-art research equipment is paired with the traditional paleontological resources at the Royal Ontario Museum that include a large well-equipped preparation lab and the world famous vertebrate paleontology collections. This provides a rich environment for research. Find more information on the ROM collections and facilities here. Dinosaur research focuses on ornithischian dinosaurs, the most common and diverse primary consumers (plant-eaters) in Late Cretaceous terrestrial ecosystems of the Northern Hemisphere. Ornithischian clades are ideal subjects to examine macroevolutionary patterns; They are taxonomically diverse, ecologically specialized, and have a dense, well-sampled fossil record that includes increasing resolution of their chronostratigraphic and paleoecological contexts with documented histories of climatic and environmental changes. The Western Interior Basin preserves an exceptional record of Late Cretaceous terrestrial vertebrate faunas. In particular, the Upper Cretaceous formations of Alberta and Montana form an essentially continuous terrestrial stratigraphic sequence that spans the last 20 million years of the Cretaceous Period and into the Tertiary. This geologically and palaeontologically well-documented region presents an unparalleled window into the last chapter of non-avian dinosaur evolution. It provides an excellent laboratory in which to test hypotheses of dinosaur evolution and examine patterns of faunal turnover, body size evolution, and morphological diversification in response to epicontinental sea level and environmental change. This interval is also vital to understanding factors leading to the terminal Cretaceous extinction event and the transition from the Mesozoic to the post-dinosaurian world. Current research projects aim to clarify the systematics of hadrosauroid and marginocephalian dinosaurs and provide phylogenetic and biostratigraphic frameworks in these groups in order to evaluate patterns of phylogenetic diversity, evolutionary mode, and body size evolution, and to reconstruct large-scale historical biogeographic patterns of Late Cretaceous dinosaurs to test hypotheses of climatic and sea-level controls on dinosaurian diveristy, biogeography and provinciality. Duck-billed dinosaurs (Hadrosauridae) are anatomically unique animals with a ~35- million-year evolutionary history restricted to the Late Cretaceous. Compared to other dinosaurs, the group has an exceptional global fossil record. Hadrosauridae is nested within Iguanodontoidea, a larger group of ornithopods that includes Iguanodon and other forms such as Probactrosaurus from Asia, as well as Eolambia and Protohadros from western North America . Hadrosaurids were the most diverse and abundant large herbivores in most Late Cretaceous ecosystems of Europe, Asia and North America. 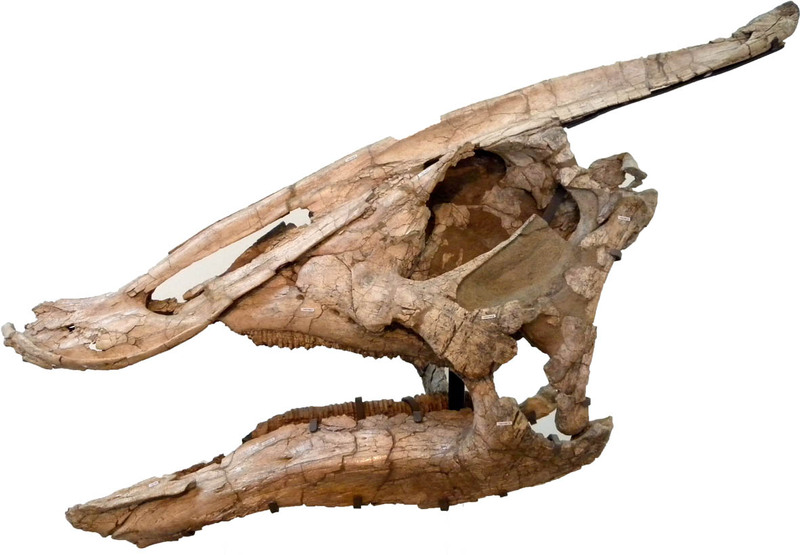 Their fossil record spans from the Cenomanian/Turonian to the end of the Cretaceous Part of their success can likely be attributed to the evolution of a complex system for efficiently processing plant material that included a kinetic skull, a broad, edentulous premaxillary rostrum (‘duck-bill’) used to crop vegetation, and an elaborate dental battery with large grinding surfaces. Due to their abundance and diversity, and their key role as dominant megaherbivores, understanding the systematics and diversity of hadrosaurs is key to understanding evolutionary dynamics of dinosaurs in the Cretaceous. Marginocephalia includes to major radiations to dinosaurs: the dome-headed pachycephalosaurs and the well-known horned dinosaurs, or ceratopsians. 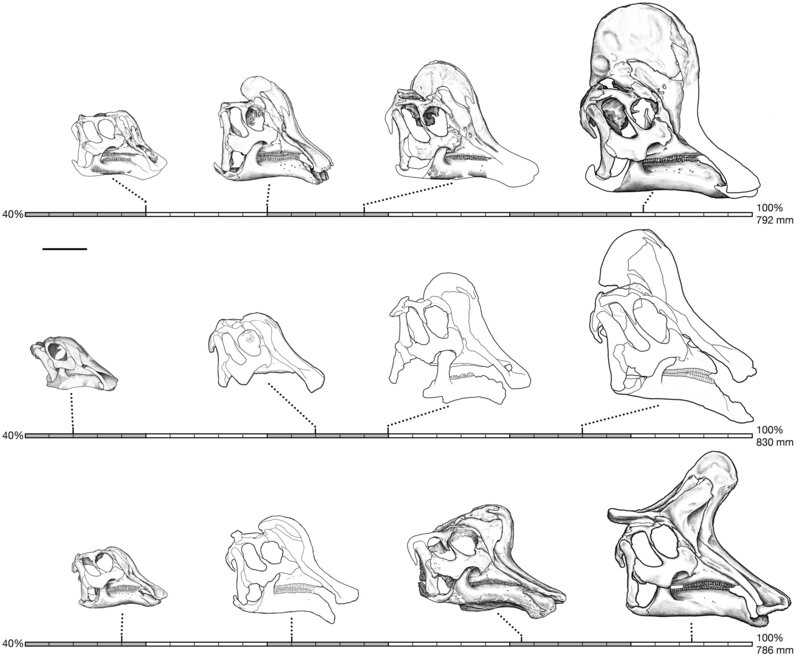 The pachycephalosaurs are a relatively poorly known gorup of bidpedal, predominantly small-bodied herbivores that are characterized by the presence of a uniquely thickened skull roof that often takes the form of a prominent dome. Research seeks to understand the morphological variation and ontogeny (via osteohistology) of this group to better understand their diversity and evolution. Ceratopsian palaeontology has seen an incredible amount of exciting new discoveries in recent years, and our knowledge of their evolution and diversity is sharply increasing. The lab is currently involved in a number of projects on the horned dinosaurs, including the description of several new species, in collaboration with Dr. Michael Ryan of the Cleveland Museum of natural history. Ceratopsian bonebeds present an increible opportunity to look at population-level moprhological variation in a dinosaur species and how it evolves through time- this is the subject of Caleb Brown’s PhD dissertation. Prosauropod dinosaurs were the first group of plant-eating dinosaurs to diversify extensively. They originated in the late Triassic, and quickly became the most widely distributed early dinosaur group. The prosauropod radiation is therefore particularly interesting as it is concomitant with dawn of the age of dinosaurs. The prosauropod Massospondylus from Early Jurassic rocks of South Africa is unique among dinosaurs because there are numerous well-preserved, articulated skeletons. In 2005, David was invited to join an international team led by Dr. Robert Reisz to document the exquisitely preserved embryos of this dinosaur that were teased from a clutch of eggs recovered from Golden Gate National Park by famed fossil collector James Kitching. Further field investigations at the site revealed significantly more egg and nest material in the small road cut locality known as Rooidraai. 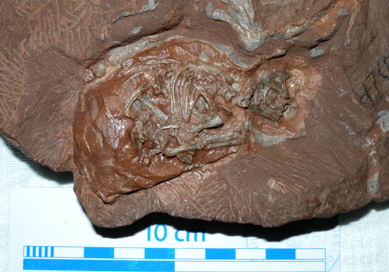 Preliminary fieldwork indicates that the site is quite rich in fossils, and we are currently engaged in an extensive research and excavation program in order to recover additional eggs, embryos, and nests that began in 2005, and resulted in the discovery of the oldest documented dinosaur nesting site. Future research aims to reconstruct the ecosystem of the site, and to document the life history of an early dinosaur in detail for the first time. This work has been supported by grants from the National Geographic Society and is currently supported by an NSERC Special Research Opportunity grant to RRR and DCE.